I just love these stardust beads!These are sterling silver 8mm beads which have a speckled texture and look to them. These beads have been added to a 24" sterling silver chain necklace with a 5" drop at its longest point.The beads on the end of the drop are connected by sterling silver swarovski headpins each with a swarovski crystal at each end giving an extra element of glamour. 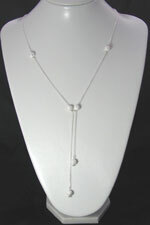 This necklace would be ideal for this seasons metallic trend and also compliment another trend of the colour grey.